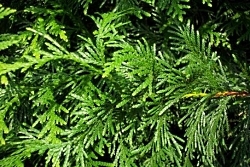 'Green Giant’ is a fast-growing arborvitae that is often promoted as a disease-free substitute for Leyland Cypress, particularly in the Southeastern U.S. 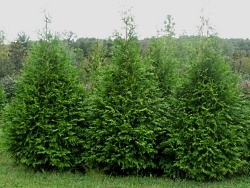 Trees may grow to 40-60’ tall with a dense, narrow, pyramidal habit, but can be easily kept more compact by pruning for screens or hedges. In the proper environment, trees can grow 3-4’ of growth per year. Perfect for a windbreak.